Frank, I'm impressed with this bullet. This load was my first for learning reloading, and it's worked out great. It's turned out to be as economical as my .22 to shoot, the quality has been very high and shipping was wicked fast. I've settled in at 8.3 grains of TightGroup out of my Rossi Model R92 (Winchester 92 clone). I shot a round into my pool and recovered it. Great lands & grooves, perfect shape and no burn or melt issues at all, so it holds up well to the rifle velocity. It's been accurate, about as flat shooting as you can expect from a Colt .45 and hard hitting. As a bonus, it also runs great in my 1911. I'm already through my first box of 500 and will be taking it hog hunting in February. 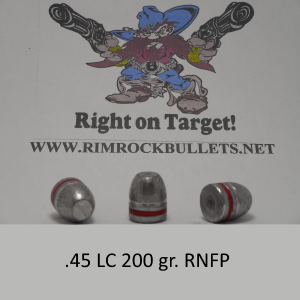 It's just a fantastic multi-purpose bullet that can do everything from plinking to home defense in a pinch. Thank you for making this product, which is really the only way I can afford to shoot center-fire rounds in bulk these days. You're the man! Edit- Just following up, I took your 200 grain RNFP hog hunting this past weekend. Using the same 8.3 grains of TightGroup powder, I dropped a 100# charging sow like a sack of bricks at about 5 yards. Awesome hunt, thanks again. Dear Frank: I'm on my second batch of this .45 bullet and love it (it'll soon be time to order more...) - I couldn't be happier! I'm getting great groups with 7.1 of 231 and 6.7 of Titegroup. Thanks - best wishes from the Kansas prairie, Richard H. B.